Good price for a second phone. Or great first phone for your child. This item is a professionally refurbished, A-Grade, Argos Manager Special - our top grade of refurbished item! The item might have non-original accessories. Please note that this mobile phone will always include the handset, battery and USB charging cable. Accessories are not included e.g. headphones, USB wall charger or screen protectors. A beautifully designed Android phone with all the essentials, including 8 MP autofocus cameras and 5 Inch polarized HD display with Corning Gorilla Glass. Built to take on life as you know it – with durable and beautiful materials, great feel, and an ideal balance of performance and battery life. What's best, your Nokia phone will stay secure and up to date with regular software updates. Whether you're the king of selfies or love taking pictures with your friends, the Nokia 3 will help you get the shot. It has a 8 MP autofocus camera on both the front and the back. And you can save and share all your photos easily using Google Photos. 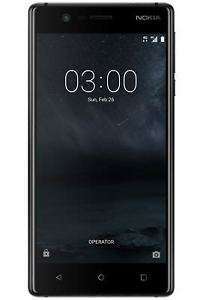 Nokia 3 comes with Android Nougat, the full spread of Google Services and no unnecessary extras. You get an experience that's focused and clutter-free. 1.4GHz quad core Android processor. Operating system: Android ndroid Nougat. Fairly decent phone for the price I bought one from the amazon.fr warehouse about 2 months ago and I'm more than happy with it. Has some poor reviews on you tube......mind you it was full price then. Is this better than that Kodak ektra thing ? Just a quick note about the phone. Brought one for a relative a few months ago (ebay - £50 which is the right price imho) and they are not a power user at all. For very basic use this phone is fine but the battery life is terrible - so bad that even when its sitting idle not being used, it drops massively. Performance wise its ok but phones at this price point aren't aimed at those who use their phone for everything or want quick response times, but for the more casual user. This doesn't sound so bad ? what's the returns policy ? Again my old Sony Xperia XA has slightly better spec mostly.